After breakfast, we drove to a cemetery just outside of Greensburg, KY, where Capt. Lindsey Duke Buckner is buried. 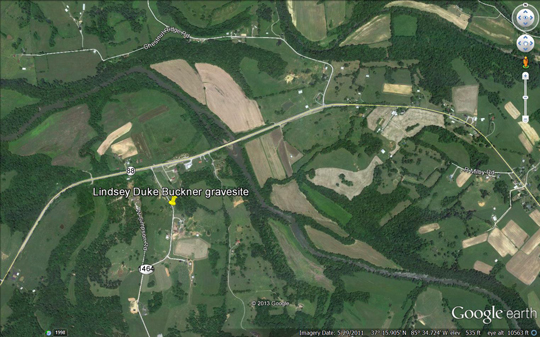 The cemetery is located a few yards off Kentucky route 1464 (reached via state route 88), across from the residence of the Judy Janes. This cemetery is known as the Edwards Cemetery and is said to include the (unmarked) grave of George Al Edwards. 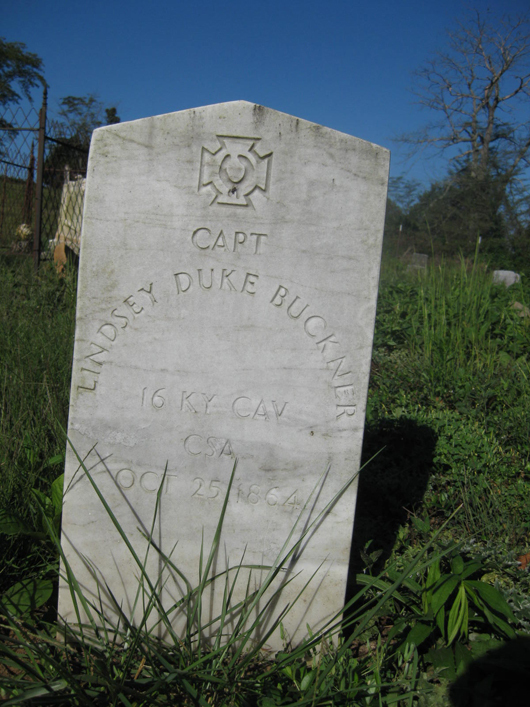 Lindsey Duke's grave is marked by a veteran's stone and is next to the grave of a cousin, Ulysses Moss, also a Confederate soldier whose grave is marked with a veteran's stone. Who was Capt. Lindsey Duke Buckner? Click here to read about him. After leaving the cemetery, we drove to the edge of Greensburg, where Mom and I dropped in on Cousin Rachel, who was happy to see us and to recall old times. We remembered Daddy and Cousin Vernon. Rachel told us that Vernon had returned to finish high school when he was 18 years old and worked his way through college (at Western Kentucky Teachers College – now WKU.) He earned a degree and became an agriculture teacher in at the high school Greensburg. He and Rachel raised six children, all of whom attended college and two completed medical school. We had only a brief visit but it was a happy one. A blurry memory (ca. 1957) from H.S. Clark's photo collection. Vernon & Rachel and family. 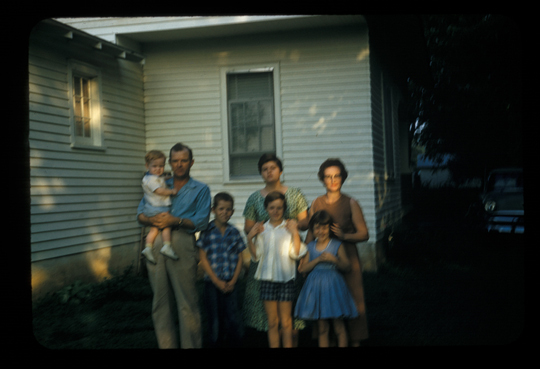 From left: Vernon holding Keith, Mendel, Nevellyn standing behind Pamela, and Rachel standing behind Camilla. In the meantime, Jane-Ann, Sara and Annis had taken off to scout out some sites in Greensburg. 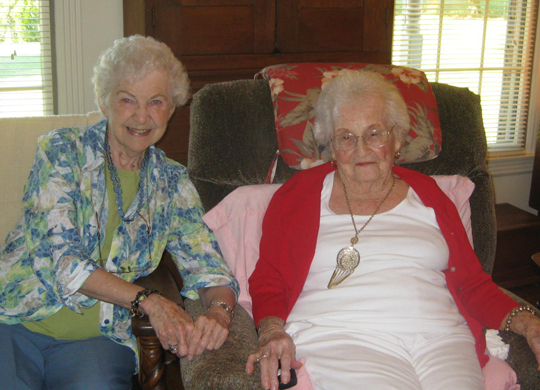 They returned with a wealth of information from the Green County Historical Society, where they had stopped and talked with Nan Montgomery and picked up a few printed publications about Green County architecture and George Al Edwards. 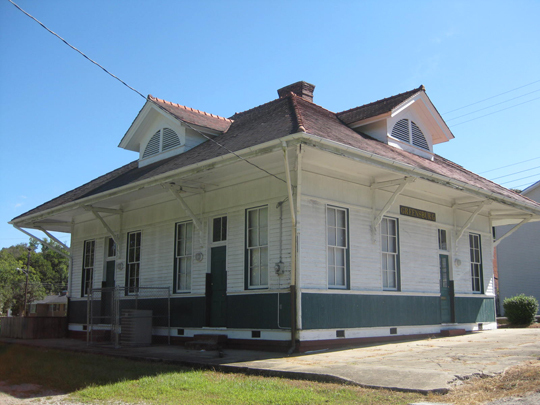 They also found the train depot and wondered if it might have been the station from which Grandma and Grandpa Clark left Kentucky in 1921 on their way to resettle in Illinois. We decided that it was, and as we drove back through Greensburg, we stopped to photograph the depot. 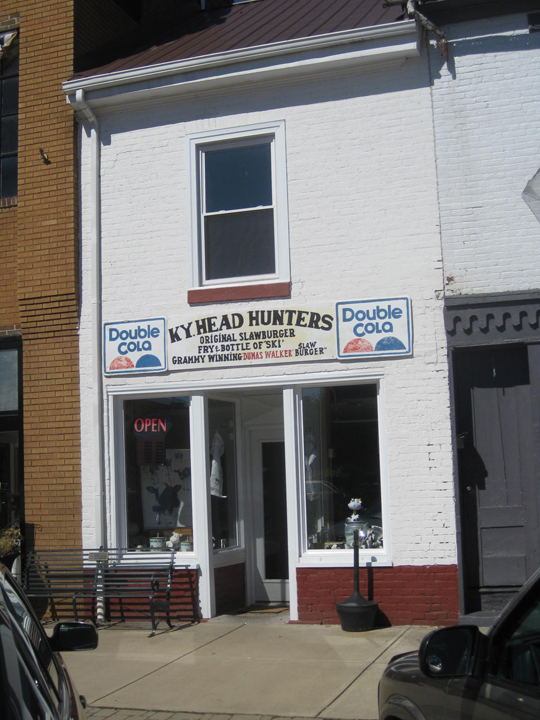 I also stopped at the KY Head Hunters café (home of the slawburger) and took a couple photos. I barely got out of there without a slawburger when the owner found out that I had traveled all the way from Illinois. I begged off, telling her that I was meeting others at Sulphur Well for lunch, but I will add the slawburger to my list of "musts" on the next trip. Across from the train depot, we noted the fine antebellum home of General Hobson, a Union general who lived in Greensburg both before and after the war and was renowned for the capture of General John Hunt Morgan.